Hybrid Air Vehicles (HAV) has planned by end 2015 the return to flight of its revolutionary Airlander 10. The huge buoyant-lift machine, which flew at the Long Endurance Multi-Purpose Vehicle (LEMV), will not be opertive until “the end of next year,” but, according to the HAV, has made progress in exploring new intelligence, surveillance and reconnaissance (ISR) applications, signing a new collaboration with sensor provider Selex ES. HAV “disruptive technology.”, developed with only 40 employees, but with 21 patents, started in 2011 and delivered his LEMV to the UK in late 2013. 304-foot-long, 1.34-million-cu-ft vehicle to the air. HAVis planning a 200-hour flight-test program leading to certification of the Airlander 10 under UK CAA Section B regulations, and/or EASA regulations still under development. According to HAV’s latest study, the potential market for buoyant-lift vehicles over the next 20 years could be worth $50 billion. Applications include outsize cargo lift into remote locations; sensitive airborne geosurveys; andISR. 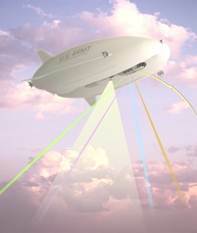 It believes that the remote access market will be best served by a scaled-up hybrid air vehicle named Airlander 50, 390 feet long with an envelope volume of 3.64 million cu ft.
A spokesman for Selex ES told AIN that the European sensor house has agreed to work with HAV in developing an ISR payload for the Airlander 10, which has a payload bay volume of up to 2,750 cu ft. Before the U.S. Army aborted the LEMV project , prime contractor Northrop Grumman is believed to have tested a combination of its very high-resolution vehicle dismount and exploitation radar with an EO/IR and a sigint sensor but only on the ground in a system integration laboratory. An HAV source told AIN that Selex ES could provide similar multi-sensor capability, including a 360-degree-view EO/IR system. HAV is trying to persuade the UK Ministry of Defence (MoD) to fund a two-month flying trial to explore potential military applications. The MoD has asked QinetiQ to study whether a concept capability demonstration would be worthwhile. What the HAV304 and AIRLANDER Surveillance Vehicles are designed to do. “LEMV … will provide substantially greater payload-duration than do the three Predator class unmanned aircraft in use today: the Air Force’s Predator and Reaper and the Army’s Grey Eagle. For example, at a 500-nautical mile combat radius, the Army’s LEMV would have a payload-duration about 80 times that of the Grey Eagle.” (Nov ‘11 US Congressional Budget Office report). The hybrid air vehicle provides an ultra-long endurance platform with exceptional stability. The US Armyhas called it a “game-changer”, due to the exceeding of the capability of all other platforms in terms of low operating costs, duration and payload. With manned surveillance of up to 5 days, at up to 16,000 feet, it offers true “persistence” in surveillance and can operate in partnership with other land, sea and air-based assets to offer a complete security solution. All this can be achieved at a comparatively low operating cost. With such endurance, the vehicle provides Situational Awareness (SA) and a pattern of life over a very large area of land and sea, which has hitherto been unavailable. In receiving this SA, commanders (either on-board or at a Commander Centre) have a much earlier warning of threats and can deploy their complementary assets more effectively. This increases operational effectiveness and reduces overall cost. The ability to operate from an unprepared base, carry more and larger sensors than competitors and do so for longer is a major tactical and strategic advantage.